I am releasing here a report that was put together by Haiti's National Police (HNP) on the involvement of some of its officers with Lame Ti Manchèt (the Little Machete Army) during the time of the Latortue interim government in Haiti. This report, put together by HNP officials, while acknowledging some culpability on the part of individuals within its force in this specific attack, it says nothing about the wider campaign of constant joint-paramilitary/police operations conducted often throughout much of 2004 and part of 2005 (as a good deal of film evidence and testimonials by witnesses and victims attest). 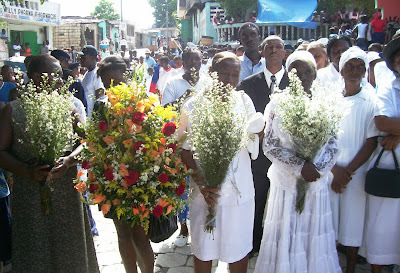 During these years, following the 2004 coup in Haiti, an unelected interim government worked with sectors of Haiti's elite and security force to constant violent crackdown's on Port-au-Prince's slums- killing, wounding, firing from jobs, imprisoning, and pushing into hiding thousands. Numerous studies shined a light on this campaign of violence in Cité Soleil (Lawyers Guild, Harvard study, University of Miami Study, Lancet, etc). Note: Although this report is thorough in identifying police involvement in the planning of the operation that resulted in the massacre, and even though it concludes that the police appeared to be passively, if not actively supporting the civilian machete killers, there is no clear culpability assigned other than professional errors and violations of the code of ethics. The only sanctions assigned are reassignments, suspension without pay, and in some cases severance of contracts. The report does conclude that the case should be turned over to the government prosecutor but only specifically mentions the civilian killers. What judicial proceedings are to arise from this report remain to be seen. Hurah, Inc. and AUMOHD will continue to press for full prosecution of the entire group of people responsible. We renew our request to Mr. Thierry Fagart, UN Human rights officer to support a just process in the case. We believe all authorities must secure the witnesses, family members, survivors and community members. The families of victims must be allowed to conduct their funerals without further delay. The families must be aided in dealing with the devastation wrought in their lives. Members of the so-called Army of the Little Machete must be apprehended so that further killings will be avoided in the community. Tom Luce, President of Hurah, Inc.
On Saturday, August 20, 2005, in carrying out legitimate orders some personnel from different units of the Haitian National Police under the Central Administration of the Administrative Police and the Administration of the Department of the West conducted an operation at Martissant intended to question suspected bandits sought after by the police. Some individuals armed with machetes, sticks, and firearms took advantage of the presence of the police to undertake some revenge which ended in the death of a dozen people. 1. Following up on some information received from his informants operating in the Martissant zone, the Director of the Department of the West, Division Chief, Carlo LOCHARD, decided to go forward with an operation at St. Bernadette Park located in the said zone where there was taking place as in every year at the same time, a soccer championship. 2. The objective of this operation was to go into the center of said park, to identify, thanks to the presence of informants, the bandits being sought after and to proceed to question them. In fact the information which the Director of the Department of the West had was that a group of individuals were regularly present (whose names were WILGUENS, SASSON, WIDMAILLE, SARDOU) and very involved in different cases of theft, homicide and kidnapping committed in the metropolitan area. 3. The operation was set for Saturday, August 20, 2005 and the Director of the Department of the West organized a briefing with those taking part with their respective teams, the division inspector Jean Michel GASPARD, Agent IV Jean Floran MATHIEU and Agent III Médard BLANCHARD, respectively identified under their code names, DDO-14, DDO-12 and DDO-13. This briefing centered on the plan prepared for the event. 4. After the briefing the Director of the Department of the West contacted by telephone the Central Director of the Administrative Police, Inspector General Renan ETIENNE, to request the reinforcement of specialized units of the Haitian National Police. The Central Director asked him to make contact with the commandants of the units in question while he, from his end, was going to pass on appropriate instructions. 5. On the day set for the operation the units involved (patrols DD0-12, DDO-13 and DDO-14) gathered in the courtyard of the director's office of the Department of the West for last adjustments. At this meeting there were police officers from SWAT Team 3 and the police inspector, Roody PETION, the man in charge of unit MO-13 from the Corps of Intervention and Maintenance of Order. After having received the last instructions from the man in charge of the operation (police officer Jean Floran MATHIEU), the police officers present went on their way to St. Bernadette Park. Group for entering: patrol MO-14 (officers Gaudy SALOMON, Guilner LINDOR, Jean Avia LAFLEUR, Edgard PASCAL) and patrol SWAT-3 (officers Lucksonne JANVIER, Djuly JEAN-BAPTISTE, Robinson FORTUNAT), under the command of the one in charge of the operation, officer A-IV Jean Floran MATHIEU. Control of the entrance to St. Bernadette Park: patrol DDO-14 (officers Grévy LINDOR, Stevenson CLERSAINT, Jean Fednel LAFALAISE) under the command of the Division Inspector Jean Michel GASPARD. Control of the intersection of Boulevard Jean Jacques DESSALIINES-Martissant 1: patrol DDO-13 (officers Médard BLANCHARD, Michelet FILS-AIME and Nackell LOUIS). 8. Once the deployment was in place the group charged with entering went to the field where the first half-time of the match was finishing. The man named Reginald MICHEL, one of the informants of the Director of the Department of the West for the zone accompanied them to identify the bandits who had to be questioned. The officers opened the main gate and went in to the applause of the crowd, estimated at more than seven thousand people, who believed the officers were there to provided security for the sports event. 9. Officer Jean Floran MATHIEU went to the MC of St. Bernadette Park through whom he ordered the crowd to lie down while the other officers who accompanied him closed the gate at the entry. At that moment a shot rang out which, along with the clanging shut of the gate and the order given by the officer in charge for the crowd to lie down, provoked a panic among those attending the game who rushed toward the exit. 10. Noticing that it was impossible to leave St. Bernadette Park by the main gate, most of the spectators of the game tried to climb the walls surrounding the field while shots were produced in an exchange between the police and the bandits who were trying to cover their flight and to avoid an eventual arraignment. 11. The shots made inside St. Bernadette Park and the garage next to a school classroom "Republic of Peru" resulted in the death of two people: a presumed bandit who exchanged shots with the officers in the group entering the field and the man so-called Réginald MICHEL, beaten by the bandits who identified him as an informant. No mention was made concerning the weapon which the presumed bandit used who was killed in the exchange with the police. 12. At that moment a group of individuals armed with machetes, sticks and firearms took control of the interior of St. Bernadette Park. This group of individuals, known by the name of " Army of Little Machetes" took advantage of the presence of the police to commit attacks of all sorts on the people who were trying to flee. 13. These individuals chased the frightened spectators, mainly those who in their opinion were bandits or who were connected with them and took advantage of the fact that the police did not intervene to stop their actions, killing a certain number of people among whom were: Nesdou FEVRY, Francky HERNE, Denis JEAN-MARIE, Erinel ALCIDAS, Grégory ODICE, Yvens MELISSE and another individual not identified; the names Enock LAPLANTE, Christome DORCE, Jean Milfort PETIT-HOMME and Patrick BAPTISTE were given as those wounded by machete by these individuals. -at the National gas station situated in front of St. Bernadette church. 16. These patrols did not take part in the intervention, being satisfied to control their respective positions until rain put an end to the operation. 17. The officers who had gone into the park, toward the end of the operation, made a tour in the zone situated behind St. Bernadette Park; this permitted them to discover the bodies of two other persons likely killed by machete by members of the small group called "Army of the little Machete". The one in charge of the operation called the ambulance service from the University Hospital of the State of Haiti to transport the bodies. 18. Next, on Sunday, August 21, 2005 some members of the different units of the Haitian National Police carried out, according to the instructions of the General Director of the Administrative Police, a search operation in the zone called Grand-Ravine during which some automatic weapon loaders, ammunition of different caliber and some combat clothes were confiscated. 19. During this operation a Nissan vehicle, "Pathfinder", colored red, found without a license plate was taken and driven to the Headquarters of the Traffic and Road Police. 20. At this time once more members of the little group named "Army of the Little Machete" took advantage of the presence of the police to get involved: no loss of human life was reported but several houses considered the property of bandits were burned. 1. The operation of Saturday, August 20, 2005 led by the Haitian National Police had been decided upon with the aim of proceeding to question certain presumed bandits whose presence had been pointed out inside St. Bernadette Park. B- The behavior of the officers engaged in the operation. -no measures were taken by the police with a view to bringing assistance to the spectators at the sports event who clearly were in danger. - a violation of the General Order 003, relative to the use of force. - deliberately kept silent about the number of dead bodies resulting from this intervention, which constitutes a falsification (point 2-64, Ethics Code: to make a false deposition in an investigation). He also admitted that on Sunday, August 21, 2005 in spite of the grave incidents of the evening before he passed instructions to the commander of the Group of Intervention of the Haitian National Police to the effect that a team of this unit would intervene in the zone of Grand Ravine. This intervention also resulted in important material destruction and no inquiry was made by the Central Director with regard to these events. E- Members of the small group named "Army of the Little Machete"
1. The information collected in the framework of the inquiry pursued by the office of the Inspector General is that the members of this little group are bandits who had been on a rampage in the zone and who had been chased out after February 2004. They had fled to different places of the metropolitan zone (notably to Bertin, commune of Carrefour) all the while operating in the zone of Bicentenaire under cover as refrigeration technicians. 1. The dismissal of Inspector General Renan ETIENNE, 11-PP-o1557. 2. The dismissal of Division Chief Carlo LOCHARD, 11-PP-02322. 6. The transmission of the case to the Central Director of the Judiciary Police for the pursuit of the inquiry particularly into the matter of the members of the little group named "Army of the Little Machete", identified by the victims. 7. The establishment of a uniform procedure for the conduct of operations in which units under different central administrations will be brought to work together.